Captain Joel Brandenburg of Ana Banana Fishing Company at Little Harbor Resort. Mitch Traphagen photos. Captain Joel Brandenburg, the name behind Ana Banana Fishing Company, a charter fishing service out of Little Harbor, has a resumé that doesn’t read much like a typical charter captain’s. Oh, he definitely has his fishing credentials and much more, but other things have played an important role in his life, too — kids. Especially children faced with unimaginable challenges. Brandenburg has been a full-time licensed Merchant Marine and charter captain at Little Harbor Resort for the past 10 years. He has fished around the world, from the Caribbean to Australia, South Africa to Canada. 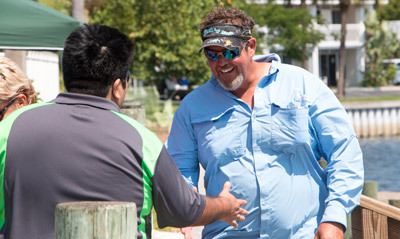 He has appeared on fishing television shows with several celebrities. But he has also studied child welfare and psychology for nearly 20 years, focusing on childhood grief issues and grief counseling. He is a volunteer with numerous organizations, many of which focus on the needs of children. 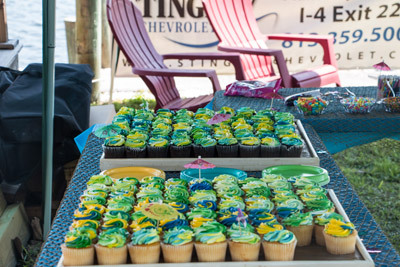 On Saturday, Brandenburg expertly and easily combined his two passions, hosting 50 children suffering from pediatric cancer and their families to a day of fishing, socializing, swimming, a water slide and, yes, even cupcakes. “We’ve been doing this for 17 years,” Brandenburg said. 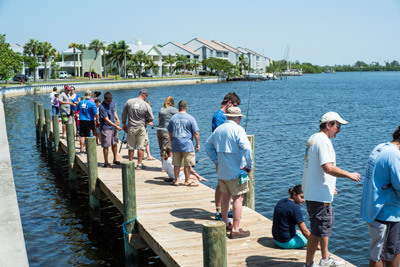 The Pediatric Cancer Foundation Kids Fishing Derby was held at Hooks Waterfront Bar and Grill at Little Harbor on Saturday, May 23. It was a private event for kids and their families. Numerous area businesses and sporting-goods retailers joined in to help sponsor the event. As the crowd of children and family members grew, Brandenburg greeted each new arrival with a bright smile from his deeply tanned face. As lines were cast out from the dock, he and his crew from Ana Banana Fishing Company offered advice and encouragement. Before long, the first fish was caught, and promptly returned to the water to live another day. The first fish of the day. It was promptly returned to the water. It was a day devoted to the kids. This weekend, beginning Thursday, May 28, Brandenburg and Ana Banana will host the 10th annual Phil Pegley Black Tip Shark Shootout to raise money for the Pediatric Cancer Foundation. The captains’ meeting will take place on Thursday and the event will culminate at approximately 3 p.m. on Saturday, with photographs from the catch-and-release tournament. Additionally, beginning next month, Brandenburg will kick off the 2015 Ana Banana Kids Fishing Camp. Two of the 13 weeks of the camp are currently filled, but many prime weeks remain open for registration. The camp fees include bait, tackle, rod and reels, fishing licenses, a cooler with ice drinks, a camp T-shirt, goody bags, prizes, awards and a graduation certificate. 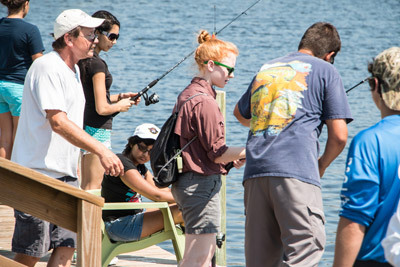 For more information about the Kids Fishing Camp, visit www.anabananakidsfishingcamp.com or call 813-267-4401. 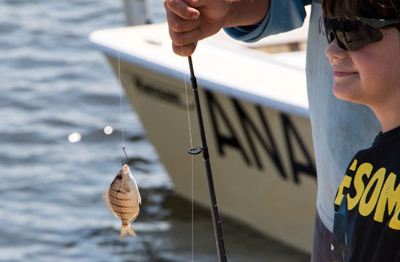 For more information on Ana Banana Fishing Company and fishing charters, visit www.anabananafishing.com.